June is one of my least favorite times to be in the Sierra, owing to the preponderance of mosquitoes that come out during that month. On the other hand, temperatures begin to climb in other parts of the state around this time, and this weekend was forecast to be a scorcher - 100F in the major valleys and deserts, 90s throughout much of the northern and southern parts of California. I hit upon the idea of visiting the White Mtns on their east side, primarily to tackle about 10 summits found in Zdon's book, Desert Summits, that I'd yet to visit. I was scheduled to meet Patrick on Thursday afternoon which gave me two half days to do some hiking and scrambling in Yosemite. I timed my drive from San Jose to coincide with the hottest part of the day, not arriving at Tenaya Lake until nearly 5p. By then the temperatures were starting to subside while I still had more than three hours' time to play. Located about 1.5mi NE of Tenaya Lake, Dozier Dome lies beneath the south side of the more massive Medlicott Dome. Because it lies about 3/4mi from SR120, it is not all that visible unless one knows where to look. The NW Face is a 400-foot wall that is said to have some respectable rock climbing routes. I parked at a small turnout on the east side of the road, crossed Tenaya Creek and spent about 20min wandering through the forest to the base of the dome. I turned right and started climbing up along the base of the cliffs until I reached the easier slabs on the southwest side. The scrambling is no more than class 3 with a fine view of the cascades descending from Cathedral Lakes to the south. 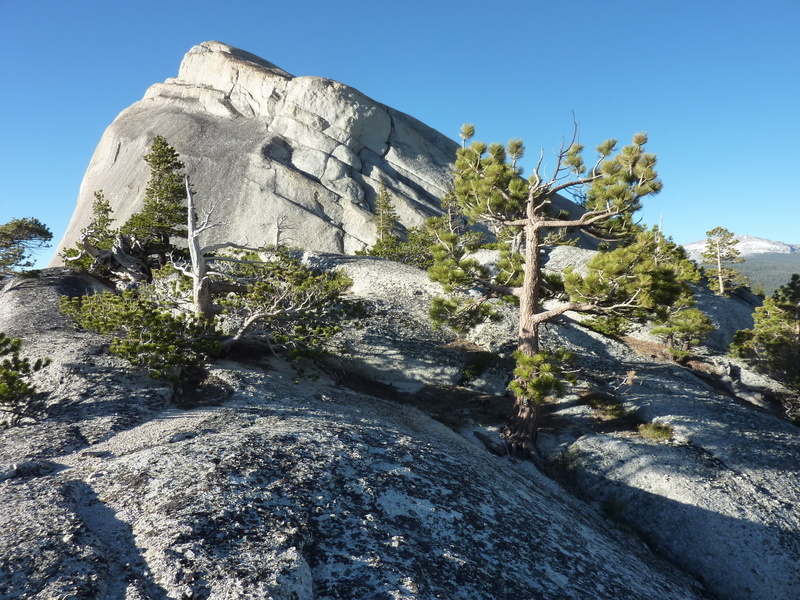 The summit block is an imposing 10-foot granite boulder, made easy by a few well-placed stepping boulders to aid the ascent (The first two look to have been placed there by human effort. Though they aren't actually helpful for the ascent, they add a sense of symmetry and balance). Cathedral Peak and Echo Peaks/Ridge can be seen rising high to the east beyond more forest. Medlicott rises not quite so high to the north. Tenaya Lake and Polly Dome share the view to the west. I descended down slabs on the northwest side, a little stiffer than the SW slabs, but still class 3. I was back to the highway and the van a little over an hour after starting out. Nice little scramble, this one. This unnamed dome lies north of Medlicott and west of Fairview Dome, adjacent to the highway on the south side. It has an imposing 500-foot wall on the west and north sides, but has class 3 options elsewhere. I parked off the highway west of the summit and headed into the woods towards the SW Ridge. Easier options are found by moving well to the right, but I found the scrambling quite enjoyable nearer the edge of the ridge, mostly class 3 slabs but some stiffer slabs and even a nice lieback that I used at one 20-foot section. I ended up backing down this lieback when I couldn't make further progress upward, eventually finding a groove further right that worked better. The summit offers simultaneous views of Half Dome/Tenya Lake to the southwest and the spread of Tuolumne Meadows to the northeast. Falls Ridge, Cold Mtn, and the higher summits of Northern Yosemite can be seen to the northwest and north. Polly Dome and Mt. Hoffmann are prominent to the west, but mostly washed out by the lowering sun on this late afternoon visit. I descended the easier class 2-3 on the northwest side, traversing around the North Face before returning to the start at the highway. It was 7:30p by the time I pulled into the Lembert Dome parking lot. A pair of dirtbagging climbers were cooking a meal at one the picnic benches while swatting mosquitoes made active by the cool evening air. I scrambled up the steep slabs just right of the popular climbing routes on the west and southwest faces. I had been up this feature 13yrs earlier with my then six year-old son. That time we had gone up the south side slabs, not quite as steep as the SW side, but a challenge nonetheless given his age. I found my way to the top in about 20min, about half an hour before sunset, with a fine view for my effort. There were various parties hanging out near the summit awaiting the setting sun. I spoke briefly to a few of them as I made my way down the NW side. I dropped to the high, forest saddle with Dog Dome before climbing the far easier dome to its highpoint, a s hort class 1-2 effort. For the return, I wasn't sure exactly where to find the Lembert Dome Trail and ended up descending to the west from the saddle between the two domes, eventually winding my way down around the base of Lembert Dome to return to the parking lot. There was a climbers' use trail in places, making the cross-country fairly easy, getting me back to the parking lot before 8:30p.